No other living tradition can claim scriptures as numerous or as ancient as the ancient Indians; none of them can boast of an unbroken tradition as faithfully preserved as the Vedic tradition. Vedic literature is the most ancient and extensive religious writings in the world. Hindu religion is not derived from a single book. It has many sacred writings which serve as a source of doctrine. Hinduism is very much a religion of revelation. Hindus of the past were highly thoughtful people, and their literature is characterized by constant concern with humanity’s spiritual destiny. In response to this concern they have created elaborate philosophical concepts and wrote great epic poems, narrative literature and fiction. They evolved the most perfect language in the world, Sanskrit, with a scientific alphabet and perfected vocabulary, and a grammar which is itself a great work of art. 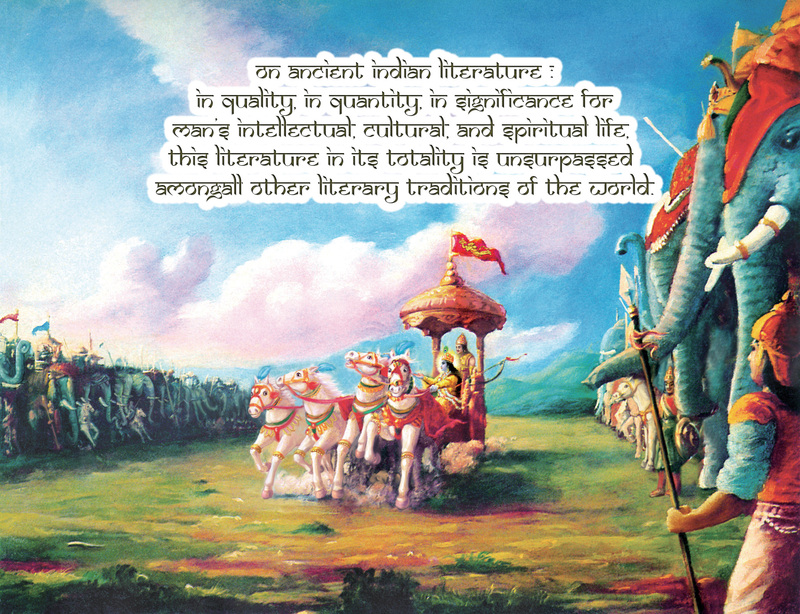 Sanskrit literature can be classified under six orthodox heads which form the authoritative scriptures of the Hindus. Sruti in Sanskrit means “that which is heard.” Thus the Vedas are the eternal truths that the Vedic seers, called rishis, are said to have heard during their deep meditations. The Vedas are not considered the works of the human mind, but an expression of what has been realized through intuitive perception by Vedic rishis, who had powers to see beyond the physical phenomena. As such, Vedas are considered of divine origin. The Vedic truths were originally transmitted by the rishis to their disciples over thousands of years by recitation. At a later date, these were compiled by Sage Vyasa for the benefit of future generations.India’s teachings are not speculative. They are based on divine revelations. Indeed, the revelations are so cosmic that they approach more closely the findings of physics and astronomy than the pious pronouncements of preachers. The rishis made claims so cosmic that even modern physics seems only to be catching up with them and realizing, after every scientific breakthrough, that the ancients were there long before them. The Rig-Veda Samhita is the grandest book of the Hindus, the oldest by far. Its style,the language and the tone are most beautiful and mysterious. Its immortal Mantras embody the greatest truths of existence,and it is perhaps the greatest treasure in all the scriptural literature of the world. explanations of the rites in sacrifices, supplementing the Rig-Vedic Mantras. The Sama-Veda Samhita is mostly borrowed from the Rig-Vedic Samhita, and is meant to be sung in sacrifice. The Atharva-Veda Samhita is meant to be used by the Atharva-Vedic priest, to correct the mispronunciations and wrong performances that may accidentally be committed by the other three priests of the sacrifice. The Brahmanas or explanations of Mantras or rituals. The Aranyakas (philosophical interpretations of the rituals). The Mantra-Samhitas are hymns in praise of the Vedic God for attaining material prosperity here and happiness hereafter. They are metrical poems comprising prayers, hymns and incantations addressed to various deities, both subjective and objective. The Brahmana portions guide people to perform sacrificial rites. They are prose explanations of the method of using the Mantras in the Yajna or the sacrifice. The Aranyakas are the forest books, the mystical sylvan texts which give philosophical interpretations of the Rituals. The Upanishads are the most important portion of the Vedas. The Upanishads contain the essence or the knowledge portion of the Vedas. The philosophy of the Upanishads is sublime, profound, lofty an soul-stirring. The Upanishads speak of the identity of the individual soul and the Supreme Soul. They reveal the most subtle and deep spiritual truths. Isa, Kena, Katha, Prasna, Mundaka, Mandukya, Aitareya, Taittiriya, Chhandogya, Brihadaranyaka, Kaushitaki, and Svetasvatara and Maitrayani. Smriti means “that which is remembered.” Smriti scriptures are derived from the Vedas and are considered to be of human origin and not of divine origin. They were written to explain and elaborate the Vedas, making them understandable and more meaningful to the general population. Smritis lay down the laws which regulate Hindu national, social, family and individual obligations.Smriti, in a broader sense, covers all Hindu Scriptures save the Vedas. These embody all that is in the Vedas, but only in a simpler manner. These works explain the great universal truths in the form of historical narratives, stories and dialogues.The Ramayana and Mahabharata are the most popular of the Itihasas that have been read, spoken about, preached or theatricised. The Ramayana, the Adi-Kavya or the first epic poem, relates the story of Sri Rama. The ideal man. It is the history of the family of the Solar race descended from Ikshvaku, in which was born Sri Ramachandra, the Avatara of Lord Vishnu, and his three brothers. The ideal characters like Rama, Sita, Lakshmana, Bharata and Sri Hanuman that we find in Ramayana firmly established Hindu Dharma in our minds. The story of the birth of Rama and his brothers, their education and marriages, the exile of Sri Rama, the carrying off and recovery of Sita, his wife, the destruction of Ravana, the Rakshasa King of Lanka, and the reign of Sri Rama, are described in detail in Ramayana. How a man should behave towards his superiors, equals, and inferiors, how a king ought to rule his kingdom, how a man should lead his life in this world, how he can obtain his release, freedom, and perfection, may be learnt from this excellent epic. The Ramayana gives a vivid picture of Indian life. Even today our domestic, social, and national ideals are copied from the noble characters in the Ramayana and the Mahabharata. The great national heroes stand even today as beacon-lights to guide and inspire the people of the whole world. The lives of Rama, Bharata and Lakshmana provide a model of fraternal affection and mutual service. Sri Hanuman stands as an ideal unique Karma Yogi. The life of Sita is regarded as the most perfect example of womanly fidelity, chastity and sweetness. The Ramayana is written in twenty-four thousand verses, by Sage Valmiki. The most important part of the Mahabharata is the Bhagavad-Gita. It is a marvelous dialogue between Lord Krishna and Arjuna on the battlefield, before the commencement of the great war. Bhagavan Sri Krishna became the charioteer of Arjuna. Sri krishna explained the essentials of Hindu religion to Arjuna. Just as the Upanishads contain the cream of the Vedas, so does the Gita contain the cream of the Upanishads. Arjuna saw before him his dear relatives and teachers in the battlefield. He refused to fight against them. Then Lord Krishna imparted knowledge of the Self to Arjuna and convinced him that it was his duty to fight regardless of the consequences. Afterwards Arjuna gave up his delusion. All his doubts were cleared. He fought against the Kauravas and achieved victory. 1.Vishnu Purana, 2.Naradiya Purana, 3.Srimad Bhagavata Purana, 4.Garuda (Suparna) Purana, 5.Padma Purana, 6.Varah Purana, 7.Brahma Purana, 8.Brahmanda Purana, 9.Brahma Vaivarta Purana, 10.Markandeya Purana, 11.Bhavishya Purana, 12.Vamana Purana, 13.Matsya Purana, 14.Kurma Purana, 15.Linga Purana, 16.Siva Purana, 17.Skanda Purana and 18.Agni Purana. They also give elaborate details about entology and cosmology, liberation, devotion, meditation, philosophy of Mantras, mystic diagrams, charms and spells, temple-building, image-making, domestic observances, social rules, public festivals etc. The chief sects of Hinduism, viz., Vaishnavism, Saivism and Saktism, base their doctrines and dogmas on their respective Agamas. The Vaishnava Agamas or Pancharatra Agamas glorify God as Vishnu. The Saiva Agamas glorify God as Siva and have given rise to an important school of philosophy known as Saiva-Siddhanta, which prevails in South India. The Sakta Agamas or Tantras glorify God as the Mother of the Universe, under one of the many names of Devi (Goddess). These are the intellectual section of the Hindu writings, while the first four are intuitional. And the fifth inspirational and emotional. Darsanas are schools of philosophy based on the Vedas. The Agamas are theological. The Darsana literature is philosophical. The Darsanas are meant for the erudite scholars who are endowed with acute acumen, good understanding, power of reasoning and subtle intellect. The Itihasa, Puranas and Agamas are meant for the masses. The Darsanas appeal to the intellect, while the Itihasas, Puranas, etc., appeal to the heart. Though this large and highly significant list of scriptures forms the basis of knowledge that can aid us into spiritual growth it must be noted, that in the Upanishads themselves knowledge was divided into 2 types. The Inferior Knowledge comprises of all the knowledge that we have discussed as being a part of Ancient Culture. This knowledge, although highly beneficial was not experiential. If in the form of words it was words from another, if in the form of books it was books written by another. This knowledge is highly beneficial to all those who are seeking the Superior Knowledge as it helped to carve out the path towards attaining the superior knowledge. Truth is unmutated, uneroded and pure existence. It’s the form of pure consciousness. We use the word “pure” because our mind and intellect are only reflections of the consciousness. This is the final knowledge and truly acquiring this knowledge you are one with all. One is then established in the truth. With ones identification with the body mind interactions and identification with names and forms,one is just a small identity separated from ones own source. This phenomena vanishes when one resides in the Supreme Knowledge- Para Vidya. This form of knowledge is entirely experiential and beyond the mind or the intellect. The ancients encouraged one to veer away from any form of dogmatism by carving out methods to directly experience the truth. The path laid out in the scriptures can take one towards complete self realisation. This is the path of yoga and most definitely the primary reason we posses the ability to experience reality with a discriminating faculty. According to the scriptures a human life here on earth is even more precious than any rebirth even in the heavens that the gods enjoy, as on this plane we can go beyond the heavens to the purest of existence in the subtlest and all pervading realm of unconditional love and eternal truth. Excellent post. अथर्ववेद could have been expanded. Thank you. There is a lot more that could have been written about, just that the post was getting so large a few details had to be omitted. Shall delve into it deeper as soon as the opportunity arises.